Our first book has just been published! 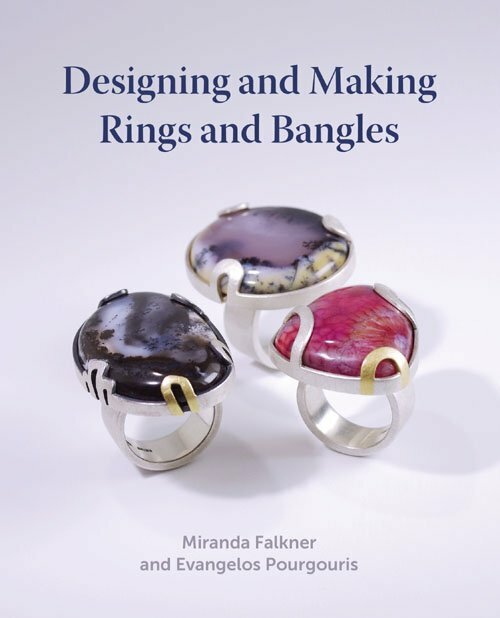 Titled 'Designing and Making Rings and Bangles', we wrote this book to share our methods and experiences in designing and making jewellery gained over the last 25 years or so; with it, we hope to inspire the next wave of contemporary makers. Rings and bangles are timeless jewellery pieces; from simple elegance to bold creations, they make stunning statements. This beautiful book explains traditional techniques with step-by-step guides, and gives inspiration through stunning examples from leading jewellers. Written both for beginners wanting to make their first ring or bangle and for the more experienced looking for inspiration. Lavishly illustrated with 200 colour photographs, it encourages jewellers of all levels of experience to express themselves and make unique pieces of jewellery to be worn and treasured. The book first gives a full account of the design process, from initial observation to developing, selecting materials and finalizing an idea. It then offers advice on equipment and materials - looking at the tools required and how to use materials in innovative ways. There are step-by-step guides to traditional techniques including simple forming and soldering followed by detailed instruction on more elaborate ways of making and decorating work, including casting, texturing, etching, granulation, inlay and keum-boo; as well as a guide to using gemstones with a range of settings. Finally, emphasis is given on the importance of finishing the ring or bangle and achieving perfection. You can purchase the book directly from our publishers Crowood Press.